I know this may seem a bit odd, but I absolutely love creating Christmas cards starting in July. This is a great time to get a head start on your holiday cards and even getting them addressed and ready for postage. 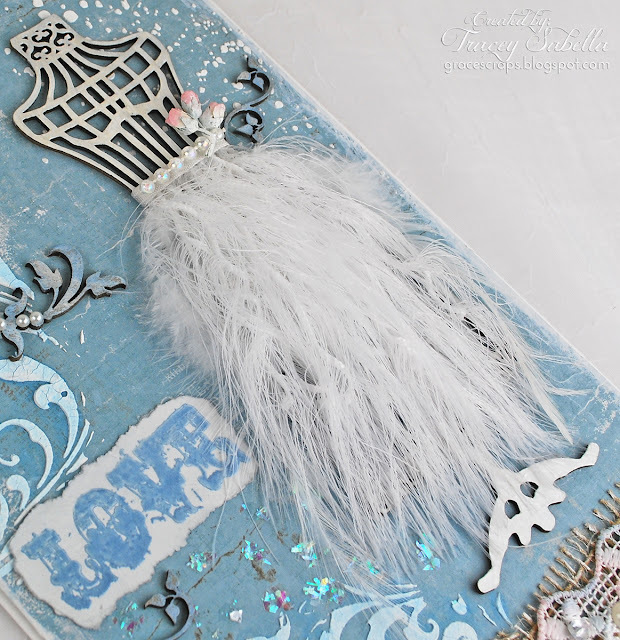 Today I'm going to show you one of the cards I created for Christmas using Helmar Adhesives. The Helmar products I used for this project are: Premium Craft Glue and Zapdots White Round 1/2". Beginning with my first layer, I start by applying mediums such as molding paste using a stencil, inks, mist and stamping. Although I'm using pattern paper, I really like adding more contrast and dimension to my projects. Next I'll adhere the top layer to the card base and continue to build my layers. After adhering a layer of mixed patterned papers, my next layer is stacked with dimension by using Zapdots. 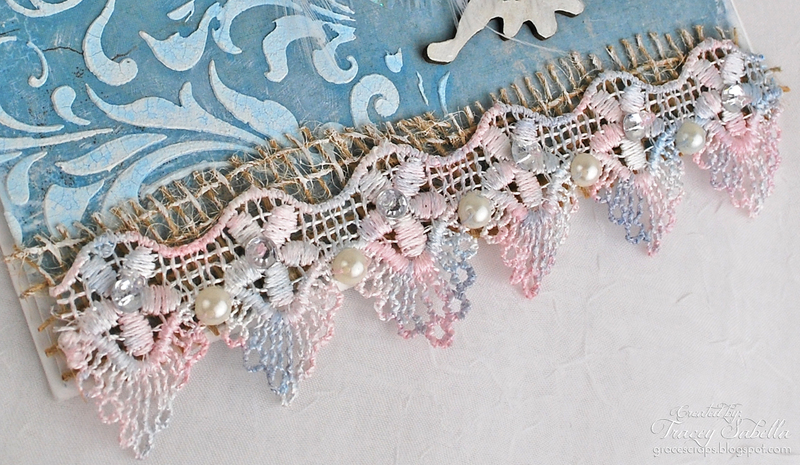 I also use Helmar Craft Glue to adhere lace, which gives me ample time for placement adjusting. Now for a tip: Because this mini frame will be placed in a spot between a flat surface and one that has dimension, I used both adhesives to achieve proper placement. I don't let any of my Zapdot pad go to waste...I cut a narrow portion of the Zapdot pad and adhere it to one side of the mini frame. On the opposite side of the mini frame I used Craft glue. I hope you have enjoyed this tutorial and have been inspired to begin on your holiday greetings. Hi Helmar fans, It's Tracey back to share a wedding card with you. One of my dear scrapbooking friends was married last month. Since we've been friends for several years and have spent many an hour creating together, I wanted to create something extra special for her. The focal piece of my card is a chipboard mannequin I dressed up with eyelash yarn and feathers. 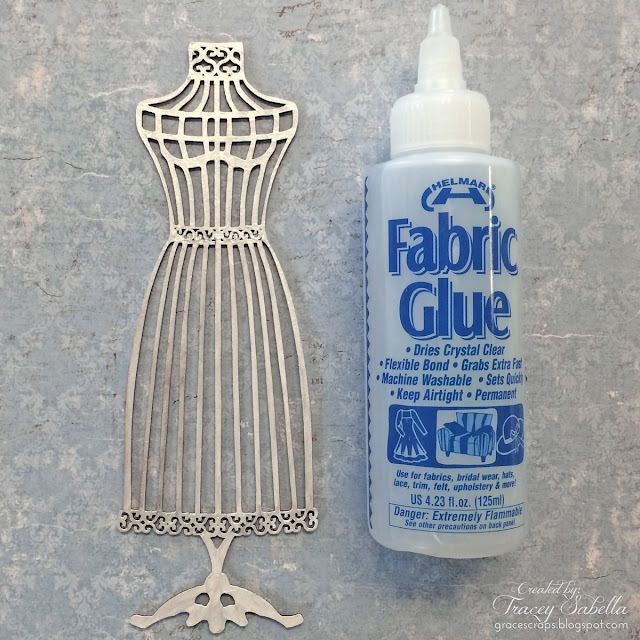 Helmar Fabric Glue is the perfect adhesive for this task. I started by painting the chipboard with a pearlescent medium. It's not shown here, but I precut the yarn pieces a little longer than the distance between the waist and the hem. and placed the yarn and feathers into this bead of glue. I covered the glued area by adhering a strip of ribbon across the waist, over the edge of the yarn pieces. I finished it off with a strip of pearls and tiny rose buds. These are adhered with Helmar Fabric Glue as well. 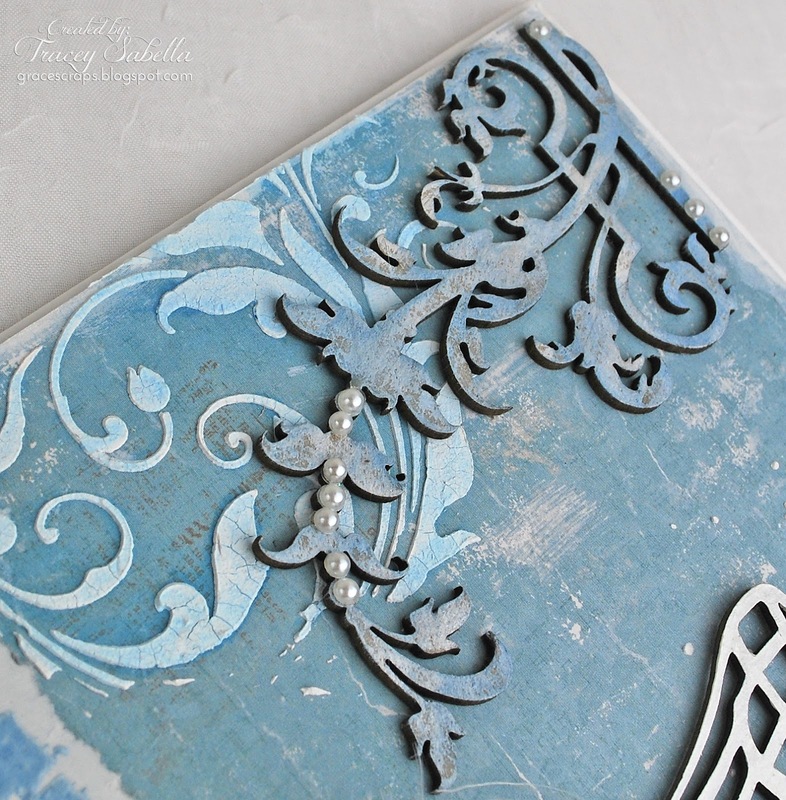 I painted this delightful chipboard corner flourish and added half pearls to embellish. Because the background is uneven from the stenciling, I needed a strong adhesive to hold it in place. Of course I grabbed my Helmar 450 Quick Dry Adhesive for this job. I stamped the love sentiment on a scrap of cardstock. I wanted it to lay flat, so I used Helmar Clear Zapdots where there was no stenciling and a dab of Helmar 450 Quick Dry Adhesive on the stenciled areas. Because the clear Zapdots are so thin, they gave just the right amount of dimension to help my sentiment to sit evenly on the card. sentiment and sprinkled with iridescent shaved ice flakes. 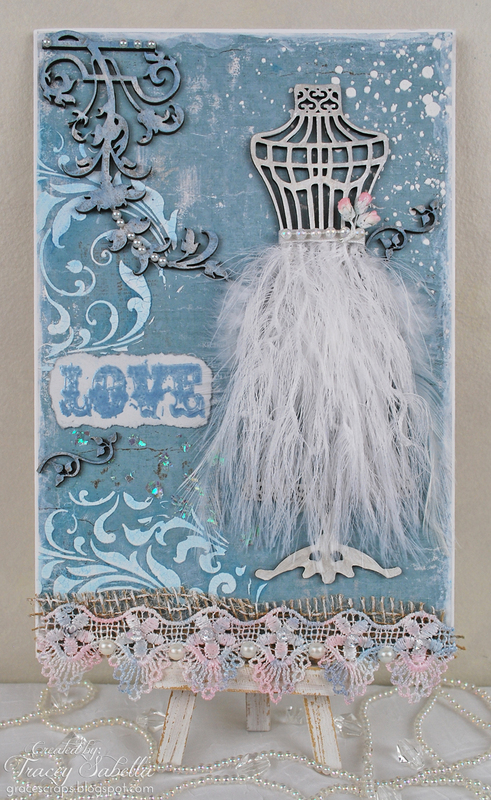 Here I used more Helmar Fabric Glue to adhere burlap and hand dyed lace to the bottom of the card. 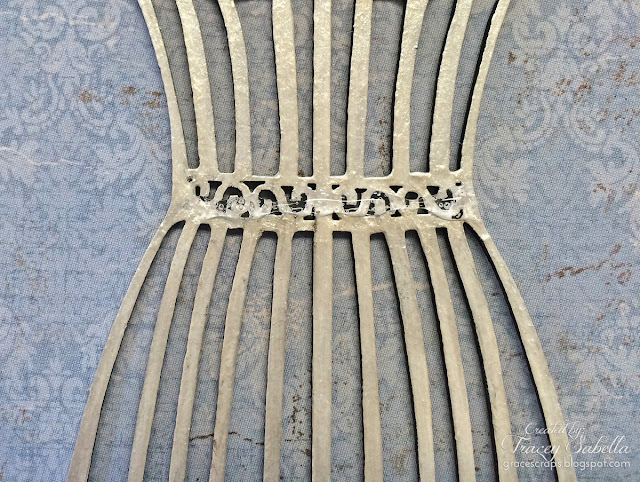 the fiber elements to your next shabby chic project. Zapdots - Clear, Square, 1/2"
Please stop by my blog for a complete product list HERE. Hi all, it's Vicki-Ann here today. I have been using a Moleskine sketch Art Journal and I just love the paper in it. My problem is, the black cover is just so boring and I want to wait till I finish the journal before I do the covers. If I did the cover at the start by the time I got to the end of the journal it would be covered in so much paint and everything else I use to make art. I am a messy Art Journaler. So my solution. I just love fabric, so thought ok I will make something I can slip over my Moleskine journal. Something that is easy to get on and off and still uses the handy elastic strap that comes with the Moleskine Journal, to keep it closed. So first I had to select fabrics. I had to work out how big it had to be to cover it and allow for seam allowance. I didn't have a pattern, I just popped the journal on the fabric and cut out a piece of fabric allowing for seams. That was my inside piece. So then I wanted strips for the outside pieces joined together, so I used the inside piece for a pattern, also allowing for seam allowance between the pieces and cut and sewed these together. I cut fabric wadding the same size so three pieces. Cover, batting and backing. I also made an allowance with the cover to be a little longer as my art journal will expand with use. 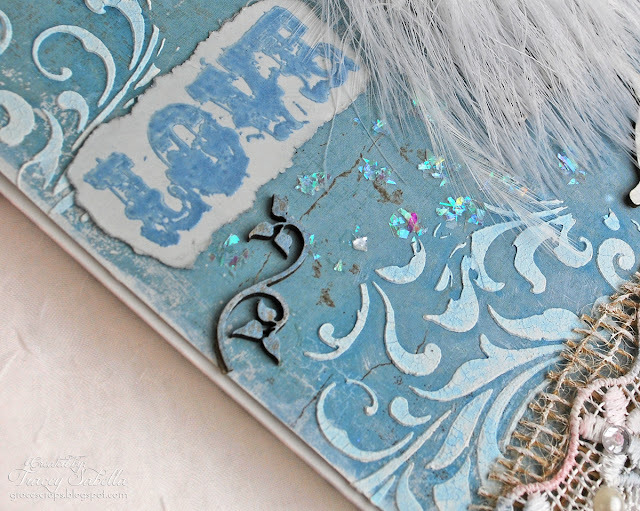 I wanted some fabric words on my art journal cover and I had this wonderful So Soft fabric paint from DecoArt. I just stenciled the letters in Lamp black onto some linen fabric it worked a treat. I then frayed the edges I like the scruffy look it gives the word blocks. This is the part for the Helmar Spray adhesive is to the rescue. I sewed one of the word blocks on with pins and my sewing machine. Yea that was ok but thought I really don't know how I am going to do the closure with the elastic, that was the tricky part. (I ended up making a piece that the back cover slides into and sewed it into the back of the cover to hold it). I did not know where the word blocks were going to be positioned yet. If they were going on the front and side and did not want the words to be in a spot were you could not see the design of the cute girls on the Kimmidoll fabric. This is what happens when you are not sure where things go when you are experimenting and making something for the first time. So I sprayed the back of the 2 remaining words with Helmar spray adhesive and well that was fabulous. You have no idea how many times I stuck and re-stuck were I wanted those 2 remaining words. It was wonderful to be able to move them around, put my journal in and out to look and see how it was positioned. I even forgot I had stuck them on when I turned my journal to the right way after sewing and there they were still stuck. It was so handy no jabbing myself with pins (yes they are sharp and I always do it). Then I just hand sewed those 2 remaining stuck word blocks on with a cross stitch and embroidery thread with them still being sticky this was no problem. It has been a while since I have done any decorative hand sewing and I enjoyed the process. I also went around the edge of the whole cover with a blanket stitch. My old sewing machine did not like all those layers and would not sew around the edge for me. I like the blanket stitched edge of the journal though, it gives a nice finishing touch to it. Three red buttons sewed on and it was all finished. Well hope you liked my project for today. I love the feel of the pretty padded fabric cover, it will be a pleasure to see and use it now. I took a number or painted papers from my stash and swaps, and began by taking the chipboard and covering it with the papers. I use Helmar's Craft and Hobby PVA Glue. It's the best for adhering paper. After my covers were done, I created the spine, scoring every half inch and leaving the ends of 1.5 inch to tuck into the covers. After I cut my flag pieces, I stuck those down wtih Helmar Professional Acid Free Glue. I used it in case I decided to not to adhere pictures or words to the sheets. This glue is awesome for album use and on pitures.. So I am guessing it will not yellowing/aging near the glued areas of my precious papers. Here is a little collage I made of the book. Trying to give you a view of all the possible angles I could think of. Thanks a lot for checking out my post and project today. I hope I have given you some ideas to create your very own Flag Book with Helmar Adhesives! Hi! Martice here, sharing a fun and quick way to use up those scraps of leftover, monoprinted papers! Look at objects with "new eyes". I discovered some interesting patterns on the bottom of pastry containers! I've started with a neutral, earth tone color (Yellow Ochre) as my base. STEP 2// Use a Stabilo pencil to loosely draw a circle, two inches above the center of the page. Soften some of the lines with a wet paintbrush by tracing around them. STEP 3// Paint with wild abandon! I alternated between a fan brush and a #8 round brush for the next steps. Bahama Blue is my main color field. Use the #8 round brush to add drips and splatters in Teal metallic paint. (TIP: If you notice any hard edges, lightly blend both colors until the line appears seamless.) Let dry. I love the spontaneous look of the blue mass in the center. So expressive and free, don'tcha think? STEP 4// Stamp a rectangle in the center of the page. Then, stamp with your favorite butterfly stamp. STEP 5// Scribble words along the outline of the rectangle. Add washi tape. The monoprinted scraps in this tutorial have been designed with stencils, doodling, metallic accents, textures, torn edges, and of course, my signature graffiti script! STEP 7// Draw a rectangle along the edges of the scraps. (See red arrow, below.) These repeating rectangles will act as a frame and geometric design to the strong, organic nature of the collage. STEP 8// For more variety, let's incorporate another metallic element. Add gold thread with machine stitching. Stitch along the pencil line, created in Step 7. STEP 9// Splatter fluid acrylic paint (Pyrrole Orange) with a #8 round brush. Splatter the paint to accentuate, not dominate. Let dry. I began by rounding up some found objects, 2 CD's, jar caps, heavy plastic, bottle caps and buttons - just about anything will do! For the eyes I used bottle caps and buttons along with some glitter and paint. First I painted the inside of the bottle caps and then filled in with some Helmar Craft Glue. Next I pressed the button into the glue and added a sprinkle of glitter over it. Set it aside to dry. Next I wanted to work on the body but was a little stumped as to what to use. Then I remembered the acrylic skins I made and brought them out to see how it would work. I loved it, lol I used my Helmar 450 Quick Dry Adhesive to adhere both the skins to the CD and the jar lids to the skin. Next I painted the wings and beak using Earth Safe Finishes Chalk It Up paint on some heavy plastic. Then used my hole punch and some wire to create a hanger to display him with. The wings/hanger is sandwiched between the front CD and another CD for the back, so he is 3 layers in all. Everything was glued on with my Helmar Silicone Adhesive Sealant because the surface were a little uneven due to the wings and wire. I just LOVE how he turned out, he looks so cute that I will have to have him hanging on my porch for awhile before he gets moved out into the garden! Whoooo knew making garden art could be so much fun? Hi everyone, Nicole on the blog today to share a throw pillow I made for my sister and her husband. I've made quite a few throw pillows the last year or so, but this one is different in that I cut out and filled a few shapes from underneath. The pillow I made from a piece of drop cloth material. I set up the design in Silhouette Studio and cut the whole thing from vinyl. The vinyl gave me a little grief when I placed it on the drop cloth. I couldn't get it to lay completely flat and seal around all the hearts really well so I used a small foam brush in an up and down motion to add black acrylic paint. Once the vinyl was removed I took a pair of fabric scissors and removed the middle of three of the hearts. I traced the cut out hearts onto pieces of drop cloth. I wanted to add ribbon behind the cut outs and this way I had a shape to give me an idea of how much of the area to fill as well as a base to attach to the backside of my pillow top. I used Helmar Fabric Glue to fill the hearts and placed ribbon over the top. Once the glue dried I placed them behind the cut outs and pinned each one in place. I glued each of them down with more Helmar Fabric Glue and reinforced the edges with Helmar 450 Quick Dry Adhesive since I accidentally purchased a plastic lined drop cloth. Once the glue was dry I decided to add a few more finishing touches with embroidery floss. I went around the edges of two of the solid black hearts and filled in the bottom heart. I finished by sewing the back on to the pillow top and placed my pillow inside. It's Wednesday and the weekend is fast approaching, now time to get creating! Here is a layout to inspire you to pull out those wonderful Helmar products and see where they can take you! Kathleen here to share how I created this layout. This layout is all about layering. 11x11" Hello Sunshine paper (Use Helmar Craft & Hobby PVA Glue to adhere the first two paper together as shown above). 9x9" reverse side of Beach Towel Stripe paper (glue it off center on top of the last paper). 6x12" Beach Party paper (glue this paper 1 1/2" from the right hand side). Select and cut out various 4x6" cards and arrange them in layers behind the picture. To the left hand side I used a doily for added texture and interest. I used two straws of different colors and cut them in graduating sizes then glued them in place with Helmar Craft & Hobby PVA Glue. I get a lot of mileage from this glue. It offers a bit of wiggle room time after placing my element to the paper. Once everything is in place and glued I can rely on Helmar that it will stand the test of time! I placed the photo on a piece of corrugated cardboard to give it height using Helmar Professional Acid Free Glue. With this glue it will not yellow my picture over time. Now to finish our fun and summery layout with loads of flowers and cardstock sticker! Always adhere them with Helmar Glue! Thanks for stopping by today. I hope what you have been inspires you to create! Remember to include Helmar Products! Helmar Professional Acid Free Glue. That would be the driver's side door of my car as of Friday, July 3rd. Just goes to show, it doesn't matter what your "canvas" is, art is art! There are a lot of ways to go about creating an art car (more about that over on my blog, today), and a lot of different materials you can use--everything from house paint to enamels--but once you've put in the hours, the important thing is that the work you did is protected. And to seal in the portrait of my simian sidekick, I used Helmar Crystal Kote Gloss Spray. It helps to know that you'll have a clear day (or couple of days, depending on the complexity of the job) to work, since you probably don't want to drive a half-finished car around or worry about losing some of your work to rain. I picked a long weekend with plenty of sun, and set up a canopy (eventually) to shield me from the sun in the backyard as I worked. A properly prepared surface is pretty key to the success of a project like this. So that means you clean it, you sand the areas that need to grab the paint, and you use a primer both to have a good starting surface as well as (especially in the case of a dark car) lessen how many coats of paint you have to apply. Then comes the fun part! Make yourself comfortable, grab your paints, and go to town. I was concerned the paint would be too thin and run or it would take so long to dry that I wouldn't get everything done in a timely fashion--neither of those fears were founded! Thanks, I think, to the sunny day and naturally warm surface of the car, the paint dried almost instantly! The model paint also went on darker than expected and covered amazingly well, so only one coat was needed (except for the silver, that needed a second coat). I added details to the finished painting with an enamel pen, gave the surface a good swipe with the surface solvent to remove any dust I didn't want to seal in, and then gave it a good coat of protection with Helmar Crystal Kote Gloss, following the instructions on the back of the can. It's rained almost every day since I painted the car and the varnish is doing exactly what it says: the paint isn't going anywhere and it has a nice shine that matches the rest of the car with no signs of dulling. NB: Whilst we encourage exploring new applications and uses of our products in the name of creativity and art. We must offer a caveat that the application and use shown in this project of Helmar Crystal Kote Gloss varnish has not been subject to testing and trials of any nature by Helmar Australia Pty Ltd or Helmar USA Inc. This is purely the inspriational creativity and work of the designer presenting the project. We therefore offer no warranties or guarantees of any nature for any application or use of Helmar products beyond the scope of those listed on the product label. If you choose to use Helmar Crystal Kote Gloss varnish for the application shown in this project you assume the entire risk for results achieved, any damage caused and product suitability for this application. Hi Veronica here today to share with you my latest mini album using Ikea (Tolsby) frame, Helmar Tacky Craft Glue and also the Helmar 450 Quick Dry Adhesive. This is a quick and very cute way to make a mini album for your desk, coffee table and also make a great gift. First I gather what I think I am going to use. Making sure that I have enough of one element of my choosing that will be placed throughout my album for that cohesive look. I chose to use Helmar Tacky Craft Glue because it is very versatile and great for adhering paper. I used my scraps of paper to decorate the back side of my pages. This is a flip album so be sure that your pages are going in the right direction. For me the first page or "cover" of the album is very important and I am especially thoughtful to the details because the front is the theme for the rest of the album. I very much enjoyed creating this mini flip album and having the right adhesives to make the process go smoothly is imperative. For the finishing touch I tied some ribbon on the rings. Hope I have inspired you to create some cute albums using Helmar. For the product list of my papers and embellishments used above please visit my blog.